The deflector of discord between the Italian factory and all the others, except Yamaha, arrives at the RC213V from the third race of the year. Technical innovation in COTA, the Texan circuit that hosts the GP of Las Americas this weekend. This is the st release by Honda on the motorbikes of its Ducati deflector pilots. As he had been aware for some time that it would be safe for Crutchlow, and Márquez has just confirmed to Spanish journalists that he will also assemble them. official motorcycles: "There is something in the keel to cool the tire." (This says laughing, sarcastically) I was ready and ready in Argentina, but I did not give it much importance here, it's ready and I think it's not for refrigeration We can not say that it is for aerodynamics, so we will not say it. " Ese spoiler is the piece that has generated so much discord in the queen class during the first two dates of the 2019 academic year. in all the prototypes. It is a kind of spoon with inner wings, the house of Borgo Panigale sold it as a piece to refrigerate the rear wheel, something that the rival factories that claimed against it did not believe to understand that it was an illegal aerodynamic appendage. The confrontation started in Qatar he went to the Court of Appeal of the FIM, in Switzerland, which ended up giving the reason to Ducati. This one, already in Argentina, refused to turn the page and even recognized that her latest idea generated some downforce, but that was not her purpose and that was why she got rid of it. Gigi Dall'Igna spoke of 300 to 400 grams of downforce ( ground effect) at 180 kilometers per hour. The competition believes that it is more. Their rivals chose not to claim the TAS, but they went to work to make a similar piece for their bikes, although with a different semantic nuance when presenting it for approval before the director. championship technician, Danny Aldridge. 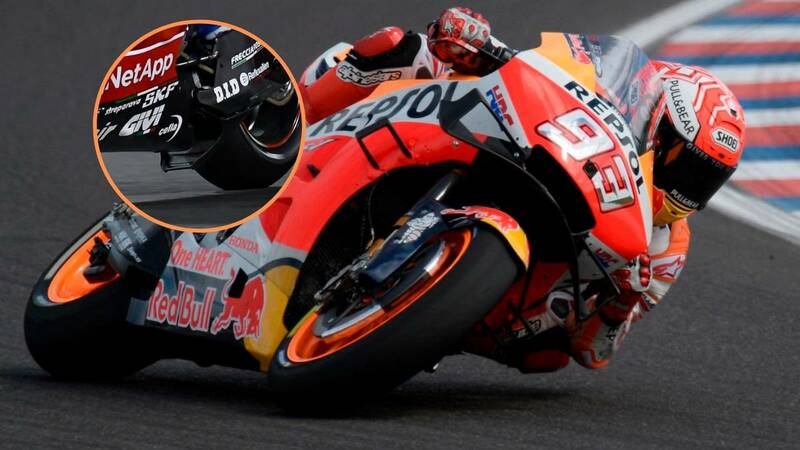 The first to move the chip was Honda, who after two attempts got the technical OK, devising for it a new purpose: to improve the rigidity of the swingarm. As Suzuki boss Davide Brivio later told Ace, "it matters more what the piece is said to be doing than what the piece really does" . The golden wing now has the spoiler manufactured and will go out on track in the Honda de Márquez, Lorenzo and English, that although looks the colors of the LCR Honda of Lucio Cecchinello, has direct contract of factory and material similar to the one of the officers at least of departure. By the way, that Crutchlow left once finished the race of Argentina very angry to see Race Direction and the Panel of Commissioners. I did not agree at all, with the sanction of a ride through for skipping the start. Before COTA, his team has put a claim, which has not prospered, and is that although in the front shot no movement is seen, on the side itself. It is minuscule, the fruit of the moment in which the Englishman carries his weight in the front train to try to help lift the wheel less in the start. Telemetry revealed that he had moved to 0.01 per hour, a really insignificant figure, but that cost him his podium options.